There are all kinds of cases: hotels that don’t offer them, hotels that let you choose, others that only have them on certain dates… Is there a criteria to go on? Any specific guide of what to do? What does it depend on? Here are a few ideas that may help you. Payment at the hotel and free cancellation, a generous and attractive action. However, like all services, it comes at a cost to the hotel: operational logistics, uncertainty and empty rooms, especially when occupation could reach 100%. The client is used to it… Both to paying more for having the cancellation option and, looking at it from the other side, to paying less in exchange to committing to the booking. This action is now employed in other services of the travel industry, such as airlines, trains, etc. Even elite and corporate hotels, which would normally be open to offering this service, have made non-refundable rates commonplace (and they are thinking about being more restrictive with their refundable-rate conditions). A service that includes everyone? Some hotels always allow you to cancel up to the last minute. In the end, this means that all clients are going to pay for it, whether they enjoy the service or not. These services come at a cost and the general price will go up in order to carry these costs. It is not a simple matter of eliminating the cancellation option on all of them, since that would reduce the standards of service. If it also includes prepayment, it could put some clients off, clients who would not be prepared to pay in advance and who may have been prepared to pay a higher rate. It is also not about “lowering” the price by creating non-refundable offers at a lower price. That would have an impact on the price. For those hotels that start with a single option, the vision would be to charge more to the group of clients who would be ready to pay for it and, on the other hand, compensate the increase by reducing the prices for the rest. A good compromise seems to be to let the client choose. You will be giving them more options and the hotel would have another tool to play with. Most of the hotels are already doing this. More efficient revenue management, by reducing the impact of cancellations. Less overbooking. A few decades ago, when last-minute cancellations were the norm, hotels used to force overbooking in order to compensate for cancellations. Today, the more confirmed bookings the hotel has, the less need there is to overbook. Better cash flow. “Non refundable” is synonymous with prepayment, or at least with the option for the hotel to pre-charge (some hotels just need the credit card to guarantee the booking without charging it). If you are a hotel with need for cash, this high number of confirmed bookings will help you. Fewer arrears. There is a huge difference between the tranquillity that comes from having a large number of prepaid bookings and, as an extreme case, a hotel that is trapped due to what it’s owed by Orizonia, Marsans or Transhotel. More profitable CPC investments. Measuring the return of online marketing is complex. CPCs are twice as complicated since they are paid for per click, without taking currency conversion into account and on top of that not having discounts for cancellations (something which does not happen with CPAs, which come with an adjustment to deduce cancellations). The fewer the cancellations, the more secure the return of your CPCs will be. Less damage if you lower the prices. Last-minute offers, or price reductions in general, are not recommended, but sometimes it is inevitable to resort to them since predictions can fail us. One of the disadvantages is that clients that already have a booking find out and, as well as going through the bother, have their booking price reduced to match the lower one. 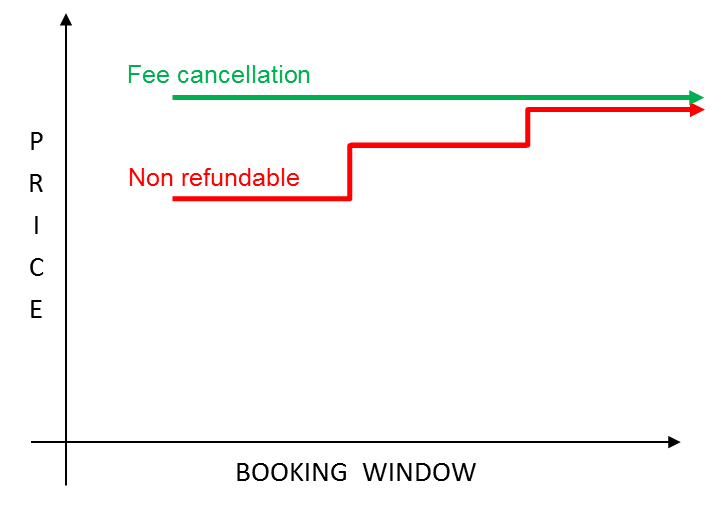 The probability of that cannibalisation effect decreases with the more non-refundable bookings that have been made. It is not because they will get annoyed if they find out about the price lowering but rather because it’s less likely that they will discover it. They have already paid your hotel and cannot cancel it: they will no longer monitor your hotel and have given up looking, and are only looking forward to the stay. However, those who can still cancel have their eyes wide open, proof of which is their high cancellation ratio. If the overall cancellation percentage of channels such as Booking.com reaches 30-50%, which is the percentage of their refundable rates? 60%? 70%? 1. The further in advance, the more value. A booking made months in advance is a gem for the hotel and a blessing for the revenue manager. On the other hand, a last-minute booking has little chance of cancellation. 2. During low season, it doesn’t matter. If you are going to have spare rooms, the “unattended demand” effect disappears. Cancelled bookings will be less damaging because they will have not left clients out who would have stayed in them but had no availability. Once again, it’s not about launching non-refundable offers during high season when you need them the least. The focus should rather be on pushing to charge the refundable rooms during those key dates at a high price. Non refundable = Prepayment? The two concepts go hand in hand but are not exactly the same and there is no reason why they should be linked. For a non-refundable rate, all that is needed is the guarantee that the hotel will eventually charge for the room, although it won’t necessarily do it as prepayment. On the other hand, charging prepayment could also not be linked to a non-refundable. In this case, refunds should be anticipated. The Riu chain, for example, allows clients to prepay voluntarily, thus keeping flexibility in their cancellation option. Be careful with payment gateways. A virtual TPV system that charges during the booking process is the most comfortable and secure way for a hotel. However, it could affect the conversion rates. Virtual TPVs are restrictive when it comes to accepting charges, even more so than the charges made subsequently at the hotel TPV. It could be refusing bookings without the hotel knowing. Sometimes, the operation can be conditioning. 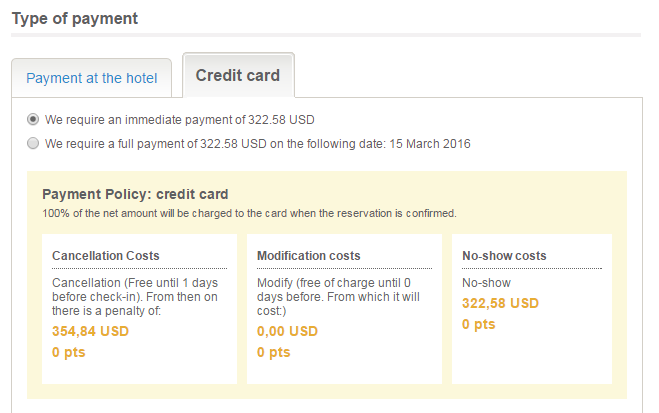 Funnily enough, some hotels have problems when it comes to organising prepayments or charging for penalties. These limitations end up conditioning their decisions. If it’s the case, perhaps they should consider whether something is going wrong. Waiving penalties? A strategy for non-refundable rooms must think about what answer to have for this subject. Judging by the pressure exercised by Booking.com, it doesn’t seem easy to find the balance between a good service and coherence. Waiving penalties would make the non-refundable concept pointless and it would be unfair towards the clients who did pay more for having the right to free cancellation. Never waiving penalties requires being ready to holding out to the pressure from Booking.com. Even though the hotel has the last word, sometimes it’s Booking.com itself who pays for the penalty costs in order to keep the client happy, making it seem like Booking.com is the good guy and the hotel is the bad guy. Waiving the penalty only if Booking.com requested would be discriminatory towards other channels. Although most hotels have found an answer to these topics and have defined their policies throughout the years, it’s not always easy to make the right choice. At least, by taking into account everything that must be anticipated, hotels are closer to doing things properly. Pues Booking solo contesta que no es posible que son condiciones especiales que no es reembolsable y que hacen una llamada al hotel y te despachan rápido. Tengo 5 reservas más en 5 ciudades distintas con Booking en mi plan de vacaciones, así que no sé qué es para Booking política de fidelizacion. He reservado otros años mis vacaciones con Booking. Es la primera que cojo no reembolsable y canceló. La verdad que me daré de baja y ya no contrataré más con un intermediario a distancia, eres un número y no tienes trato con nadie. Cuando esperas una respuesta por ser cliente desde hace años eres solo un número. No creo que Booking reembolse nada de su bolsillo, solo piensan en su comisión y una cancelación es una perdida de comisión. Lo peor la app de Booking m dio la opción cancelar gratuitamente.. Y de ahí el error, pues tenía 6 hoteles reservados y al final no m acordaba de las condiciones de esta reserva y gracias a un fallo de la app que no m reflejo los gastos de cancelación ahora pago la estancia completa. Y lo peor es que cancele 7 días antes de la llegada y a los dos dias de mi cancelación ese hotel ya no está disponible en la misma fecha. Hice el tonto, si no es reembolsable mejor es no cancelar y así el hotel y Booking no hacen negocio doble cobrando al que cancela y al nuevo cliente. Solo se debería cobrar si el hotel no ocupará la habitación, lo contrario es un enriquecimiento injusto consentido por ley. Super interesting blog post, well written! The benefits of non refundable rates are under-rated by many hotels, and it shouldn’t be. Great blog, finally a hoteliers point of view on NR rates instead of all the “how to cancel a NR for free” articles around. “Waiving penalties? A strategy for non-refundable rooms must think about what answer to have for this subject. Judging by the pressure exercised by Booking.com, it doesn’t seem easy to find the balance between a good service and coherence. I am still looking to find/write a well writen answer/explanation to send to guests why we cant/wont refund a NR. 99% of all guests feel that they deserve to be treated differently because they have real personal circumstances. Which means 99% of cancelling guests end up dissappointed in the hotels service when we do not refund a Non refundable reservation. I dont nececarrily want them to like it, but i really want them to understand. Thank you Jeroen, I am glad you find it interesting. You arise a good point: How to properly justify the cancellation penalty without creating dissatisfaction. I’m afraid we don’t have a secret formula. 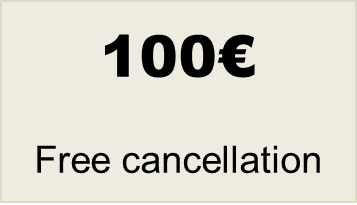 Maybe guests need to go through a learning process: For some reason they assume that cancellation fees are unavoidable when it comes to flights but they are open to discussion in the case of hotels. You hoteliers are in a better position to share your experience, as you deal with guests on a day to day basis.